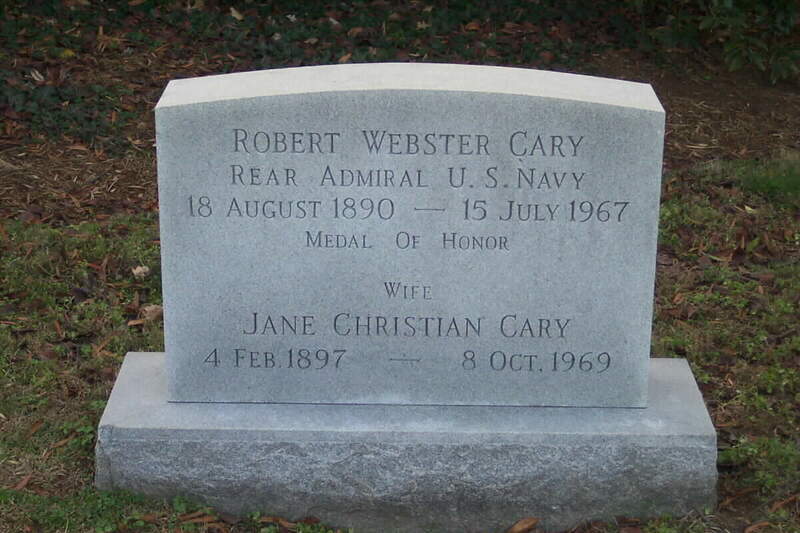 Rear Admiral Robert Webster Cary, Jr. (18 August 1890-15 July 1967) is one of the most decorated officers in the history of the United States Navy. Robert Cary was born in Kansas City, Missouri. 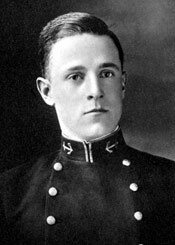 He entered the University of Missouri in the fall of 1908 but left after the first semester of the following year and entered the United States Naval Academy where he graduated in 1914. Scarcely a year after graduating the Naval Academy he was awarded the Medal of Honor for action in a boiler explosion on board USS San Diego. He was standing by the first of five boilers that blew up and saved the lives of three men by dragging them out of the boiler room. He also took charge of the situation in the adjacent boiler room, putting out the fires and thus preventing the explosion of these boilers. During World War I, Cary served on the destroyers based at Queenstown, Ireland. During World War I Cary was awarded the Navy Cross. During a hurricane, a depth charge on the fan-tail of USS Sampson broke loose, menancing the safety of the ship. Together, with three enlisted men, he went to the fan-tail, and they managed to secure this depth charge, including its safety pin, at a great risk of being washed overboard themselves. During the war years between WWI and World War II, Cary served in many capacities and many stations. 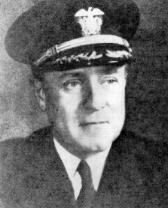 He served as the Director of Base Maintenance and in the Office of Chief of Naval Operations where he initiated the establishment of bases at home and abroad at the commencement of WWII. Cary also served with great distinction in WWII when he took part in various campaigns in the European Theater of Operations. By the time Cary retired he had achieved the rank of Rear Admiral. NOTE: His daughter, Lalla Jane Cary McCormick, the wife of William Morgan McCormick, Rear Admiral, United States Navy, died in September 2009, and was laid to rest in Arlington National Cemetery with her husband who had died in 1982. Born at Kansas City, Missouri, August 18, 1890, he graduated from the United States Naval Academy in 1914. He was awarded the Medal of Honor while serving as Lieutenant Commander aboard the USS San Diego on January 21, 1915. He died on July 15, 1967 and was buried in Section 6 of Arlington National Cemetery. 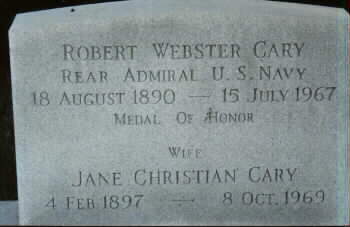 His wife, Jane Christian Cary (February 4, 1897-October 8, 1969) is buried with him. Rank and organiza~ion: Lieutenant Commander, U.S. Navy, U.S.S. San Diego. Place and date: Aboard U.S.S. San Diego, 21 January 1915. Entered service at: Buncston, Mo. Birth: Kansas City, Missouri. For extraordinary heroism in the line of his profession on the occasion of an explosion on board the U.S.S. San Diego, 21 January 1915. Lieutenant. Commander Cary (then Ensign), U.S. Navy, an observer on duty in the firerooms of the U.S.S. San Diego, commenced to take the half-hourly readings of the steam pressure at every boiler. He had read the steam and air pressure on No. 2 boiler and was just stepping through the electric watertight door into No. 1 fireroom when the boilers in No. 2 fireroom exploded. Ensign Cary stopped and held open the doors which were being closed electrically from the bridge, and yelled to the men in No. 2 fireroom to escape through these doors, which 3 of them did. Ensign Cary's action undoubtedly saved the lives of these men. He held the doors probably a minute with the escaping steam from the ruptured boilers around him. His example of coolness did much to keep the men in No. 1 fireroom at their posts hauling fires, although 5 boilers in their immediate vicinity had exploded and boilers Nos. 1 and 3 apparently had no water in them and were likely to explode any instant. When these fires were hauled under Nos. 1 and 3 boilers, Ensign Cary directed the men in this fireroom into the bunker, for they well knew the danger of these 2 boilers exploding. During the entire time Ensign Cary was cool and collected and showed an abundance of nerve under the most trying circumstances. His action on this occasion was above and beyond the call of duty.